You can never predict when or where your eye will be caught by a beautiful plant. On my first visit to South Africa I parked the car in a very run-down car park and opened the door next to huge clumps of Dietes bicolor. I knew immediately it was a plant I would be trying to grow. Even in those improbable surroundings the plant’s bold, upright foliage made it eye-catching. But what made it really desirable were the cream flowers, like flattened orchids, that covered the plant. The name Dietes refers to the close association the plant has with two of its relatives, Moraea and Iris. The foliage is reminiscent of an iris: long, stiff leaves that grow in fans about 1m (3feet) tall. Unlike most irises, though, the flower stalks are branched, and the flowers appear at the end of the stems. Creamy-yellow, they are about 6cm (2½ inches) in diameter, with a chocolate-brown blotch at the base of each tepal. Although, rather like a daylily, they only last for twenty four hours, so many are produced that the plant is in flower for weeks. As its name suggests, Dietes grandiflora has much larger flowers than D. bicolor, but has the same growth habit. The flowers are white with yellow markings on the tepals (actually nectar guides) and central segments that are lightly blushed mauve. The overall effect is a less dramatic, more gentle plant than D. bicolor. The flowers last several days, but,again, are produced so profusely that you don’t notice how ephemeral they are. 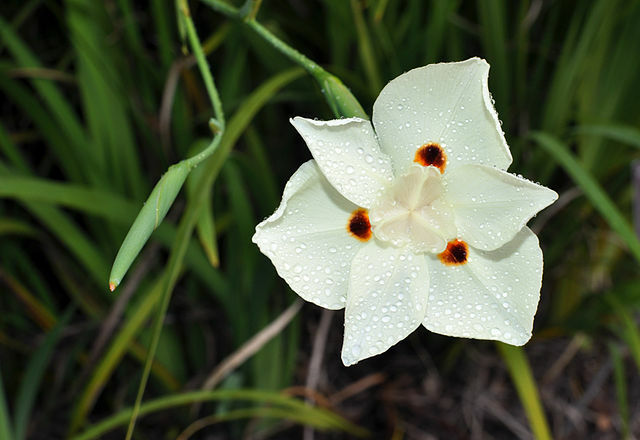 Five of the six species of Dietes are found in South Africa while the sixth, D. robinsoniana, is endemic to Lord Howe Island, a World Heritage listed island in the Tasman Sea north-east of Sydney. The wizardry of modern botanics has shown, through molecular examination, that this plant also originated in Africa. The boffins have yet to understand how it crossed the world. It obviously wasn’t anything quite as simple as the cravings of a gardener. Although gardeners in northern Europe have been growing Dietes since the mid 19th century, they are not the easiest plants to grow. Like many southern African plants Dietes are not hardy everywhere in Britain. On the clement coast of south-west Scotland or the milder areas of southern England you will be able to grow them in the garden without mollycoddling them through the winter. Although a rich, moist soil is preferable the Dietes will adapt to dry, impoverished soils. In the wild most species grow in the partial shade and so grow well under trees and shrubs. Those of us with gardens in less gentle climates have to grow our Dietes in pots. Choose a large pot, as the plant spreads quickly. Use a loam-based compost that has plenty of grit in it. Keep the compost moist from spring onwards but stop watering in the autumn. Store the pot in a frost-free greenhouse during the winter (mine are kept under the benches of an unheated greenhouse) and water only occasionally. To propagate the plant cut apart the rhizomes, as you would a bearded iris, after it has finished flowering. Plant up the new pieces in pots, where they will look unhappy and sulk for a few months but should flower the following year.